What do wireless power, a framework for measuring cyber disruption, and a vaccine aimed at eradicating two of the most pervasive and invasive viruses in children have in common? Their inventors were among those honored along with other University of Maryland’s most fearless innovators, entrepreneurs, and partners on Wednesday, April 12 at “Innovate Maryland: Celebrating Innovation & Partnerships.” Over 300 people gathered to honor the accomplishments of the university’s innovation ecosystem. This year’s celebration also marked the 30th Anniversary of the Office of Technology Commercialization and the Invention of the Year awards. 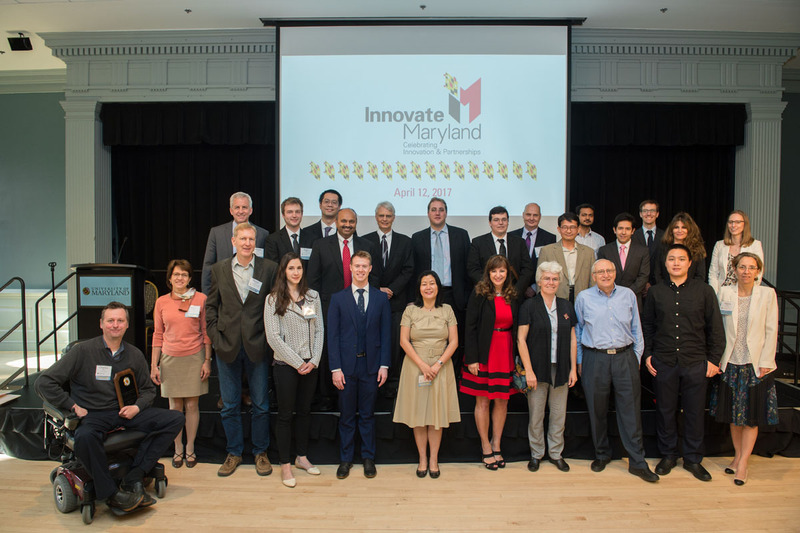 Each year, the University of Maryland (UMD) honors exceptional inventions that have the potential to make an important impact on science, society, and the free market. The Invention of the Year award nominees come from three categories: Physical Sciences, Life Sciences, and Information Sciences. One invention from each category was selected to win the 2016 Invention of the Year Award. Charles Thomas Harry, vice president for cyber and analytic solutions at Orbis Operations and Center for International and Security Studies at Maryland (CISSM) research scholar, and Nancy Gallagher, CISSM director and a research professor at the School of Public Policy, have created a method to qualify and quantify cyber disruptions by taking into account three characteristics: scope, magnitude, and duration. These three dimensions can be measured and graphed to compare the disruptiveness of various cyber events in order to better understand the implications of the disruptions. "Using a common language and risk assessment methodology can help government officials, private sector executives, and academics understand each other’s different concerns, evaluate tradeoffs, and cooperate to ensure that critical infrastructure is protected against high-consequence threats," said Gallagher. John T. Patton, associate professor in the Department of Veterinary Medicine at the College of Agriculture and Natural Resources, is developing a recombinant oral vaccine capable of inducing protective responses that restrict the growth of rotaviruses and noroviruses in the gut. This innovation will not require physicians to introduce another vaccine into the childhood immunization regimen, as the combined rotavirus-norovirus dual vaccine can be administered in place of the current rotavirus vaccine. "My goal is to have the combined rotavirus-norovirus vaccine approved for routine use in the U.S. childhood immunization program, replacing the currently used rotavirus vaccine," said Patton. "An effective combined rotavirus-norovirus vaccine could be expected to reduce the impact of norovirus disease as measured by need for treatment or related costs by as much as 80-90 percent." Steven Anlage, physics professor and Center for Nanophysics and Advanced Materials researcher, Frank Cangialosi (B.S. '16, computer science; B.A. '16, economics), Tyler Grover (B.S. '16, mathematics, physics), Scott Roman (B.S. '16, physics, materials engineering), Liangcheng Tao (B.S. '16, electrical engineering), and mechanical engineering and mathematics student Andrew Simon have discovered a potentially viable solution that will allow energy to be transmitted to a moving target using time-reversed electromagnetic signals. A power source sends weak signals over a variety of trajectories. These signals converge at one instant to deliver a large burst of power only on the target location that will use the energy to charge the battery of a mobile device. "Our wireless power transfer invention could transform society by eliminating the last tether that binds us to the grid, and eventually phase out the words ‘recharge’ and ‘power cord’ from our vocabulary," said Anlage. After the presentation of the Invention of the Year Awards, Brian Darmody, associate vice president of corporate and foundation relations recognized the University Career Center & The President’s Promise as the UMD Corporate Connector of the Year. The award is given each year to an individual or a program in the university that has established partnerships with the private sector in corporate research, philanthropy, and/or student support. The final award of the evening was the Maryland Technology Enterprise Institute (Mtech) Venture of the Year, awarded to Whisker Labs, an Earth Networks subsidiary. The award recognizes excellence in innovation by leveraging University of Maryland-originated new knowledge or technology to solve real world problems. The celebration culminated with a report on a crowdsourcing activity led by Dean Chang, associate vice president of innovation and entrepreneurship, called “Innovation March Madness.” Student innovators were asked to describe their thoughts on the key traits of innovation in 10 words or less.